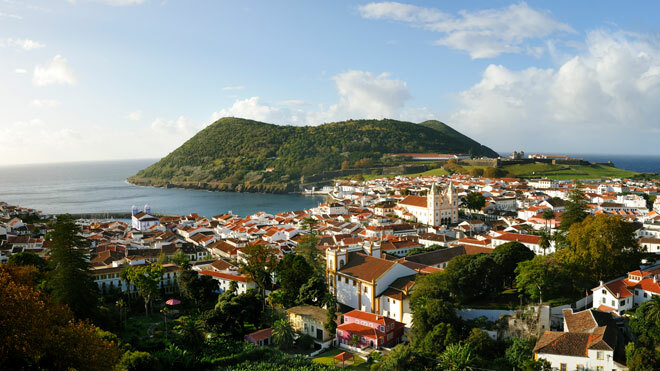 Located on the third island of the Azores to be discovered by 15th century explorers, Angra do Heroísmo was the first city established in the archipelago, strategically situated in the Atlantic Ocean. Angra gained importance as a commercial entrepôt and served as a stopover point for ships on navigational routes between Europe, the Americas and India. It was the port for offloading various products from the other islands, as well as one of the main destinations which it continues to be even today, owing to Lajes International Airport. Its long history and heritage, built up over centuries, led to this historical centre being classified a World Heritage Site. The city, as well as many other places in the Azores, has a special beauty which emerges from the contrast between the exuberant and the dark stone used in construction, revealing the volcanic origin of the islands. To visit the city, we recommend a tour that starts at the Marina de Angra (Angra Marina). Go up Rua Direita (9) to arrive at the centre of the city, the Praça Velha (Old Square) (8) from which you can identify visits to various points of interest. Also, you can continue along Rua do Espírito Santo, but its narrow walkways would require you to use the roads intended for vehicular traffic. You will find the roads in good condition, paved in limestone and basalt tiles or basalt slabs, enabling you to move around safely and steadily. However, there are many slopes, for example Rua da Sé (5), which can make the tour difficult. Therefore, it is recommended that anyone who has reduced mobility, should be accompanied to be able to overcome the obstacles. In general, main streets have wide paths, compared to secondary roads where they are narrower. In general, pavements have not been lowered. In the commercial area, there are no access ramps into shops, as well as there are terraces or illegal parking on the routes, which can cause unexpected traffic problems. 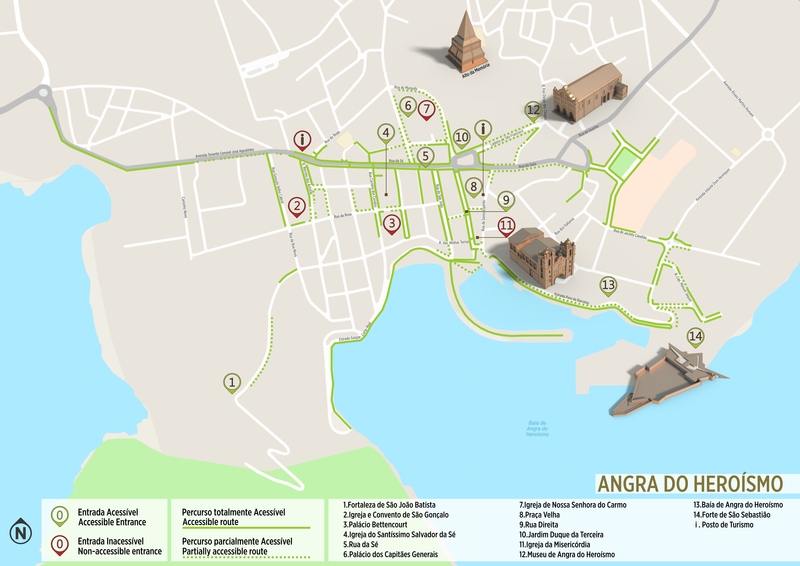 Owing to all these issues, it is recommended that you use the map above, where different degrees of accessibility in the historical centre of Angra do Heroísmo are indicated. Starting your tour on Rua Direita (9), you will undoubtedly see the imposing Igreja da Misericórdia (Church of Mercy) (11), built in the 13th century. Access into the church is by stairs, and wheelchairs will not be able to access all the places inside. However, the central aisle is wide, enabling you to enjoy a guided tour. Arriving at Praça Velha (8), go along Rua da Sé (5) to visit the Igreja do Santíssimo Salvador da Sé (Catheral Church of the Blessed Saviour Cathedral) (4), one of the two most important buildings in the city. The entrance is accessible and the internal area is wide, without any obstacles, enabling visitors to admire the gilded carving on the altars of the Holy Spirit and the Holy Christ of Mercy. Next to the Cathedral, there is Palácio Bettencourt (3), a beautiful palace dating back to the 13th century, which belonged to the Captain General of the Azores. Now, it is the Public Library. Returning to the Rua da Sé, and continuing along Rua do Palácio or on Rua Direita, you can see the old Jesuit College, divided between Palácio dos Capitães Gerais (Palace of the Captains General) (6), symbol of civil regional government since the 18th century and currently the Office of the President of the Regional Government, and the Igreja de Nossa Senhora do Carmo (Church of Our Lady of Mount Carmel) (7). Entrance into the church is by stairs or by a very inclined ramp and accessible movement inside is only possible in the main aisle. It is worth mentioning the gilded carvings and tiled panels inside the church, which date back to the 16th century. 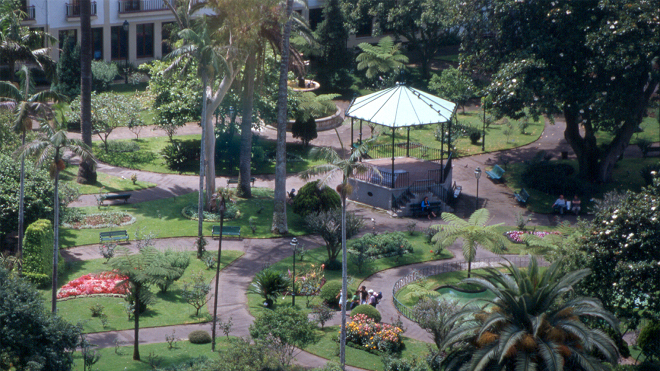 The entrance to the Jardim Duque de Terceira (Duque de Terceira Gardens) (10) is on Rua do Marquês, where you can have a break and appreciate some of the nature and the plant life which can be found all over the island. The garden is accessible with ramps which guarantee access to various levels. On top of Ladeira de São Francisco (São Francisco Slope) there is an old convent building which houses the Museu de Angra do Heroísmo (Angra de Heroísmo Museum) (12). Its collection, linked to the history of the Third Island and the Azores, is worth highlighting because of its diversity. Although the slope is at an incline, the entrance into the building is accessible and movement inside is only hampered by a few occasional obstacles. It is possible to have an adapted guided tour for people with special requirements and there are various areas with audio and video information on the exhibition. Returning to the Bay of Angra, following along the coastline, you will come to the Forte de São Sebastião (Sao Sebastiao Fort) (14), currently a hotel, with a vantage point which you can access by a ramp. The walk inside is even with occasional obstacles. 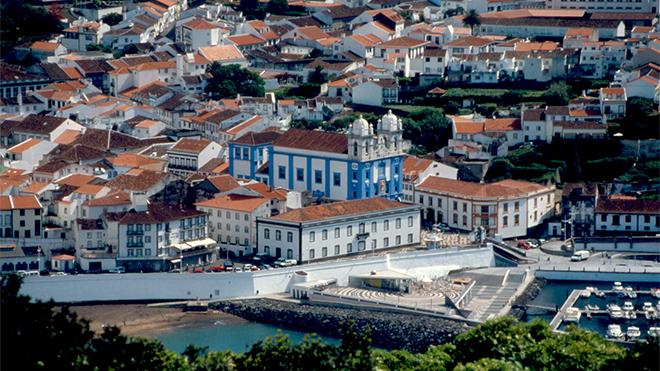 On the other side of the Bay, you can visit the Igreja and Convento de São Gonçalo (São Gonçalo Church and Convent) (2). It is the largest monastry on the island and the first to be constructed in 1545. The façade is very simple, but inside there are remarkable altarpieces in gilded carving and panels of tiles dating back to the 12th and 13th centuries, which is a good reason for entering, despite the stepped entrance. Inside, there are wide spaces but with some steps. However, a lift provides access to the upper floors. Normally, there are guided tours. A few minutes away, there is the Fortaleza and Igreja de São João Baptista (Fort and Church of St John the Baptist (1). Its construction was ordered at the end of the 16th century by King Philip II who was King of Spain and of Portugal, where he was known as Philip I of Portugal. The aim of the construction was to protect the armadas returning from India and the Americas, which passed through the Azores archipelago. You can visit the fort and church, but wheelchair access is not possible in all the spaces and the pavement is generally uneven. This monument is on the way up to Monte Brazil, a journey which we recommend doing in an adapted vehicle. It is certainly worth the effort to admire the view of the city of Angra do Heroísmo from this natural lookout. Empresa de Viação Terceirense buses are equipped with access ramps for people with special requirements, wide internal space, reserved places for people with reduced mobility, audible and luminous alerts, and Braille stop buttons. On Praça Velha, there are information screens which indicate the waiting times. In the city, tourists will be able to access automatic ticket machines which are quite low. Lajes International Airport, around 20 km from the Old Town of Angra do Heroísmo, is fully accessible to welcome people with reduced mobility. 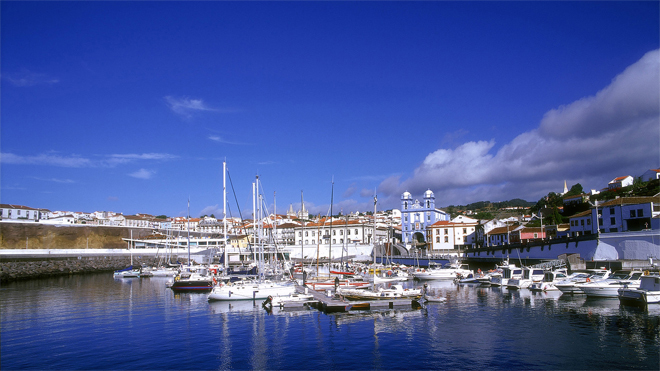 Transfers between the airport and Angra do Heroísmo are available by taxi or by Bus Line 5 (Juncal-Agualva-Angra), owned by the Empresa de Viação Terceirense. City taxis in Angra do Heroísmo are not fully adapted. Passengers will require the assistance of others to help them on and off the taxis. However, some companies have experience in transporting people with reduced mobility.